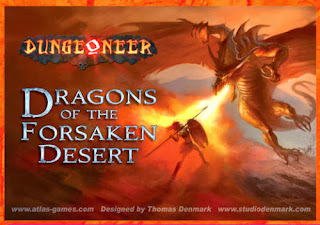 Dragons of the Forsaken Desert features a lot of crunchy mechanics, great art, and Dragons! This is the set that I've always felt got everything right. There is no errata and no typos (so far noted! ), each card is useful at all times, so you may not need that +1 Melee right now from your Scroll of Might, but its recover 1 Life ability is good to have on hand. Every card in the set is designed with this in mind. Even monsters scale well relative to their opponent's strength with "add opponent's Level..." on several of the monsters. This set has been out of print for a while, and I was amazed to see it is going for $495 or so on Amazon! Well good news, Atlas Games has found a way to get it back in print. Ok, I know what you are thinking. Lousy print quality and flimsy cards. I thought the same thing too until Atlas Games sent me a proof copy. Wow, POD has come a long ways. The quality is right up there with offset printing. The card stock is the same used in the sets printed by Carte Mundi. The colors may even be a little sharper. It is a really good product. The only drawback: no box. Well, that's ok, I know a lot of you put your Dungeoneer cards into custom boxes anyways. I know I do. If you are looking to pick up a copy of Dungeoneer: Dragons of the Forsaken Desert, mosy on over to Drive Thru Cards and order one here.